I was in Point Break! Now put this pizza inside your face and taste the infinite parameters of your own humanity! 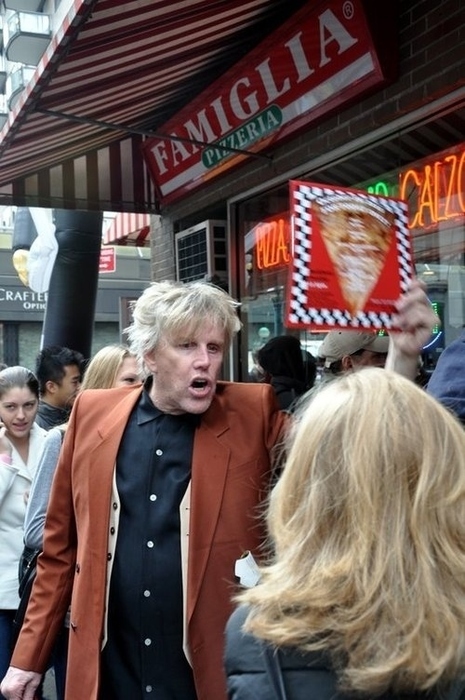 Busey, Gary — Do yourself a favor: check out these frighteningly insane pictures of Gary Busey selling pizza on the street from the filming of the next season of Donald Trump’s Celebrity Apprentice. Busey allegedly had a hard time selling the slices, however, because no one was in the mood for something half-cooked, doughy and sloppy. They also weren’t hungry for pizza. Coco, Team — With only eighteen days left until the premiere of Conan O’Brien’s new talk show Conan, on TBS, the host has been consistently turning out interesting promos and gimmicks to promote the program, including the following — a live camera set up in the stairwell of TBS which has been running for the past 24 hours and which will run until 1:00 EST today. Tune in to see what’s up — maybe you’ll catch the employee forced to schedule 23 hours of Seinfeld re-runs every day quietly crying in a corner and begging for the sweet release of death. Knowles, Beyoncé — Congrats to Beyoncé Knowles, whom Us Weekly has confirmed what many have speculated: the singer is, in fact, pregnant with her first child. Apparently, husband Jay-Z liked it so much he put a baby in it. Sansweet, Stephen J. — On Wednesday, Stephen J. Sansweet — the director of content and official head of “fan relations” for Lucasfilm as well as the keeper of a 5,000 square foot barn of his own personal Star Wars collectibles — emailed to colleagues that he will be resigning his position. Sansweet cited in his email that his reason for leaving is that “it’s time for another change and new challenges,” like making out with a girl. Transformers 3 — As Michael Bay continues work on his lates actioner Transformers 3: The Dark of the Moon, plot details have begun to emerge about the second sequel’s heretofore mysterious storyline. According to the description of the film’s novel tie-in, “The Autobots, led by Optimus Prime, are back in action, taking on the evil Decepticons, who are determined to avenge their defeat. The Autobots and Decepticons become involved in a perilous space race between the U.S. and Russia, and once again human Sam Witwicky (Shia LaBeouf) has to GIANT ROBOTS FIGHTING GIANT ROBOTS FIGHTING GIANT ROBOTS FIGHTING GIANT ROBOTS FIGHTING. Zoolander, Derek — No word yet if “Blue Steel” will make an appearance, but Paramount does confirm that the character of Derek Zoolander, created by Ben Stiller in the 2001 film Zoolander, will return to film in a series of web-based digital shorts for the studio with the potential to grow into something larger. Upon hearing the news, Sugar Ray frontman Mark McGrath grew very excited for the work, as over the past ten years he has become Derek Zoolander.